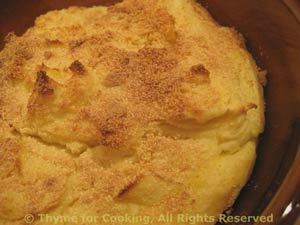 Thyme for Cooking Menus: Chicken Divan, easy recipes. We're going 'retro' with this dinner. Chicken Divan was a classic on the dinner party circuit 35 years ago. We're starting to see avocados in the markets, a sure sign that spring is coming. The Mousseline is a nice way of having mashed potatoes with no last minute work. Put chicken stock in a medium skillet, just large enough to hold chicken breasts. Cut breasts in half (the short way) and add to stock. Cover pan and poach over medium heat until done, about 15 minutes. Cut broccoli into small florets (with some stem), put into a steamer basket and steam over medium heat until barely tender, 6 - 7 minutes. Finely chop shallots and garlic (techniques). Add shallots and garlic and sauté. When chicken is done, remove from stock and add stock to white wine/shallot mix. When simmering nicely thicken with dissolved cornstarch. Add yogurt and shredded cheese, stir well. Remove from heat. In a baking dish (I use my 8 X 11 inch (20 X 27.5cm) oval ceramic) spoon 1/3 of the sauce. 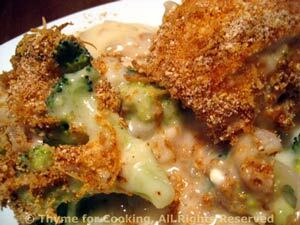 Arrange drained broccoli over cheese sauce. Put 1/3 sauce over broccoli. Arrange chicken on top, and pour over remaining sauce. Mix the Parmesan, bread crumbs and paprika and sprinkle over all. Bake in a 400F (200C) oven 15 - 20 minutes, until hot and bubbly. Serve directly from the dish. This is an interesting change from the usual mashed potatoes. More similar to a mousse, it's light and airy, and a lovely golden brown from the sprinkling of cheese. Bring a saucepan half full of water to a boil over medium heat. Add salt to water. Cut potatoes into large chunks, garlic into small chunks. Add potatoes and garlic to water, cover and bring to a boil. Partially remove lid and boil until done, 15 - 20 minutes. When done, drain, reserving cooking water. Mash potatoes and garlic together. Add enough of the cooking liquid to make very soft mashed potatoes, 1 - 2 tbs. In a medium bowl whisk egg, 2 tsp oil, pinch of nutmeg and 1 tbs Parmesan. Add 1 tbs of hot cooking water and whisk well. Stir into potatoes. The potatoes will be thick but very soft, almost pourable. Lightly oil a 1 quart glass baking dish. Spoon/pour the potato mixture in. Sprinkle remaining Parmesan over the top. Drizzle with remaining oil and bake, 400F (200C) for 20 minutes. It will puff up and turn golden. Serve.